Projects Abroad is the world’s leading international volunteering organization, with headquarters in the UK and offices and projects in over 50 countries around the world. With our global reach, we offer the widest range of volunteer projects and locations, and our own dedicated staff are on hand 24/7 to make sure our volunteers make the most of their experience and leave a lasting, positive impact. In 2017, Projects Abroad celebrates 25 years of supporting international volunteering. Since 1992, we have sent volunteers to work in 38 countries and helped 115,000 people make a lasting impact across the globe. Greg is a supported by a highly experienced core team, many of whom are former volunteers themselves, and by committed and passionate project and recruitment staff in countries across Africa, Asia, Latin America, Europe, North America, Australasia and the Pacific Islands. We are a multi-national organization that works across language, cultural and geographic lines. Cultural exchange is at the heart of who we are. They approached their geography professor, Dr Peter Slowe, to help them find opportunities to travel and work in Eastern Europe, an area then just beginning the deal with the aftermath of the end of the Cold War. At the time, with Eastern Europe experiencing significant change, it was difficult to find reliable information on opportunities for these students, especially in the days before the internet! Fortunately, Peter was able to help, using contacts among fellow geographers in the region, and he arranged for the students to go and teach English in Moldova. This is how Projects Abroad was founded in 1992. Until 1997, we were a small, family-run organization with just a few part-time staff working with Peter Slowe to help college students to go and teach English in Eastern Europe. But as more and more people were taking time away from studies and careers to travel and work overseas, and with many developing countries in need of self-funded volunteers, there was increased demand for our organized volunteer travel programs, and we have grown from strength to strength. Now after more than 25 years, we several offices in Asia, including one in Hong Kong. With more than 600 trained staff in our destinations and hundreds of projects, we are the world's leading international volunteer organization. With the help of 115,000 volunteers to date, we have accomplished a lot since 1992, and plan on accomplishing much more in years to come. 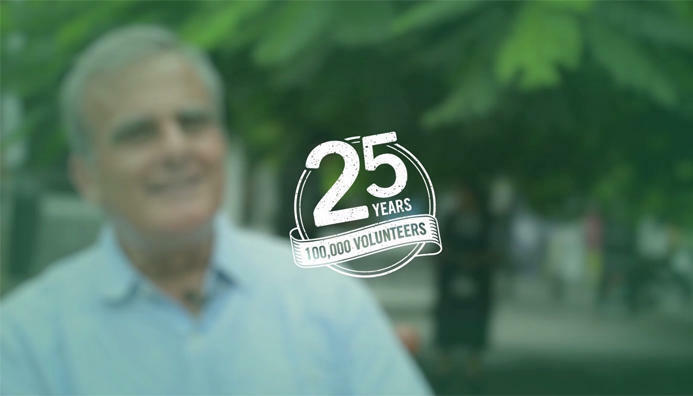 Projects Abroad volunteers are aged from 16 to 75! University students and recent graduates still make up the majority of our volunteers, but increasing numbers join us for gap years or summer breaks before starting university or while still in high school. Furthermore, our fastest growing demographics are career breakers and retirees choosing to take some time out volunteering on our projects. We help to create local employment wherever we send volunteers. We employ many people directly and provide plenty of work indirectly through the services we provide for volunteers. We have also devolved various "Head Office" functions, such as management accountancy, which is done in Mongolia and design work in Mexico. Because we work with local colleagues at all levels, our extensive network of local knowledge enables us to channel the skills of our volunteers to places they are really needed. Volunteers learn from their chosen projects and the people they meet -- and vice versa. Mutual learning and respect is what cultural exchange is all about. Now we are taking this theme of "respect" further than ever. We are truly global in our outlook. We welcome approaches from potential partners – schools, hospitals and so on – from across the developing world; wherever they are or whatever they do, we will try to meet their needs. And we welcome ideas from potential volunteers too; if a volunteer has an idea for a new program or destination, we will do everything we can to enable them to work in their own way. We will cherish their ideas and meet their requirements. We believe that flexibility on our part is a necessary consequence of our respect for our partners and our respect for volunteers. Read more about our Mission & Values. "Last year, we channeled into less developed countries the energy, skills and commitment of some 10,000 volunteers, not to mention over $18,000,000. This is a major achievement." Founder and Director of Projects Abroad.